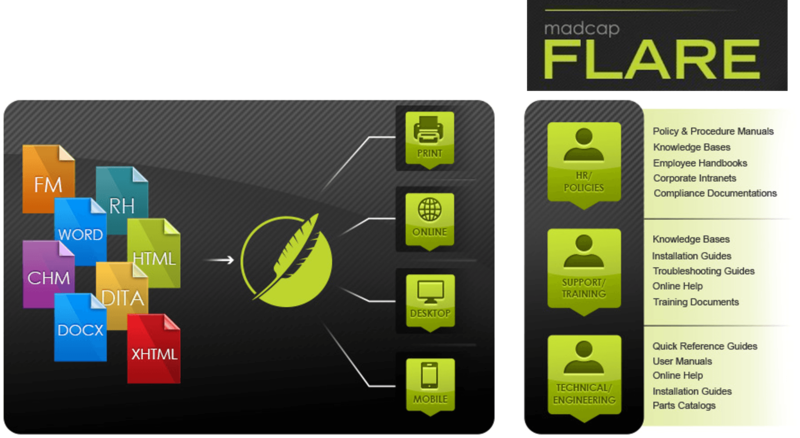 MadCap Flare is a single-sourced, XML topic-based, multi-channel output authoring, publishing and content management platform. It offers a number of unique features and advantages concerning productivity, usability and ROI when adopting a structured XML documentation environment. MadCap XML is basically standard XHTML, enhanced by additional elements (tags) and attributes (classes and properties) that support visual menu-driven output styling and conditional publishing, among other features. While MadCap XML doesn't offer the strong semantic information typing of DITA, it offers unmatched support to multi-lingual content authoring and styling. It is as well capable of importing from and exporting to DITA topics; as well as a number of widely used formats such as MS Word and FrameMaker. The benefit of controlled vocabulary is most valuable to large documentation teams and can be matched by implementing authoring practices and guidelines.